Introducing the 2019 Newbery Challenge! Welcome to another year of the Newbery Reading Challenge! Newbery and Caldecott books are fun to read - whether it's our first time experiencing them, or we're revisiting them from our childhood. If you want to challenge yourself to read more Newbery and Caldecott books this year, then you have found the right place! You can get to this level with any combination of points you want. You can read all Newbery Medal winners. You can throw in a few Honor Books. If you want, you can even read 75 Caldecott Medal winners! How you get to your point level is totally up to you. Also, anywhere in the point range for your level counts as completing that level. So for example, if you signed up for the Avi level and read 46 points' worth of books, then you have completed that level! Rereads count (because you were probably a kid when you read it last, and your perspective on the story just might have changed since then). All books must be read between January 1, 2019, and December 31, 2019. Books begun before January 1 don’t count. Books can be used for other challenges as well. Reviews are encouraged, but not necessary. Choose your point level. You can always aim for a higher point level, but you can't move to a lower one. Write a post (or a comment) stating your intention to join. Choose your point level. You can find the challenge image above to use in your post. Add your link to the Linky at the bottom of this post. Make sure you include the link to your sign-up post, not just your homepage. Sign Up for the 2019 Newbery Reading Challenge! On Monday, the American Library Association announced the winners of the Newbery and Caldecott Medals for this year, along with the Honor books. I watched part of the live broadcast, which was a fun way to participate. For anyone participating in the 2018 Newbery Reading Challenge, every one of these books counts towards your point total! If you're not participating, feel free to sign up, or just enjoy reading these books! The ALA also has many other awards, including the Coretta Scott King award, the Michael L. Printz award for YA books, the Theodor Seuss Geisel award for beginning readers, and the Odyssey award for children's/YA audiobooks. Check out the press release to see all of the amazing books that won all of these amazing awards this year! Welcome to the fifth year of the Newbery Reading Challenge! (Wow, five years already!) Newbery and Caldecott books are fun to read - whether it's our first time experiencing them, or we're revisiting them from our childhood. If you want to challenge yourself to read more Newbery and Caldecott books this year, then you have found the right place! All books must be read between January 1, 2018, and December 31, 2018. Books begun before January 1 don’t count. You don’t have to have a blog to participate. You can link up reviews from Amazon, Goodreads, etc., or just hang out with us in the comments! The Linky seems to be having difficulties sometimes. I have no idea how to fix this. If it doesn't accept your link, you can try again another day, or just put your link in a comment. That will count as signing up, too! Christine at Buckling Bookshelves made this awesome template to use for tracking your reads for this challenge. She generously offered to share it with all of you! Just click on the file below to download it for your own use! Introducing the Newbery Reading Challenge 2017! ​Welcome to the fourth year of the Newbery Reading Challenge! Newbery and Caldecott books are fun to read - whether it's our first time experiencing them, or we're revisiting them from our childhood. If you want to challenge yourself to read more Newbery and Caldecott books this year, then you have found the right place! All books must be read between January 1, 2017, and December 31, 2017. Books begun before January 1 don’t count. Reviews are encouraged, but not necessary. There will be a headquarters page for you to link up your reviews if you want to share your thoughts. The Newbery and Caldecott winners were announced this week! 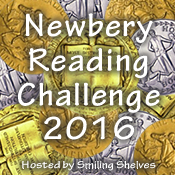 Introducing the Newbery Reading Challenge 2016! Welcome to the third year of the Newbery Reading Challenge! Newbery and Caldecott books are fun to read - whether it's our first time experiencing them, or we're revisiting them from our childhood. If you want to challenge yourself to read more Newbery and Caldecott books this year, then you have found the right place! All books must be read between January 1, 2016, and December 31, 2016. Books begun before January 1 don’t count. Write a post (or a comment) stating your intention to join. Choose your point level. You can find the challenge button below to use in your post. P.S. Sign-ups for the 2016 Newbery Reading Challenge will be live next Saturday! Now I just need to track down copies to read! I hope you enjoy them, too!